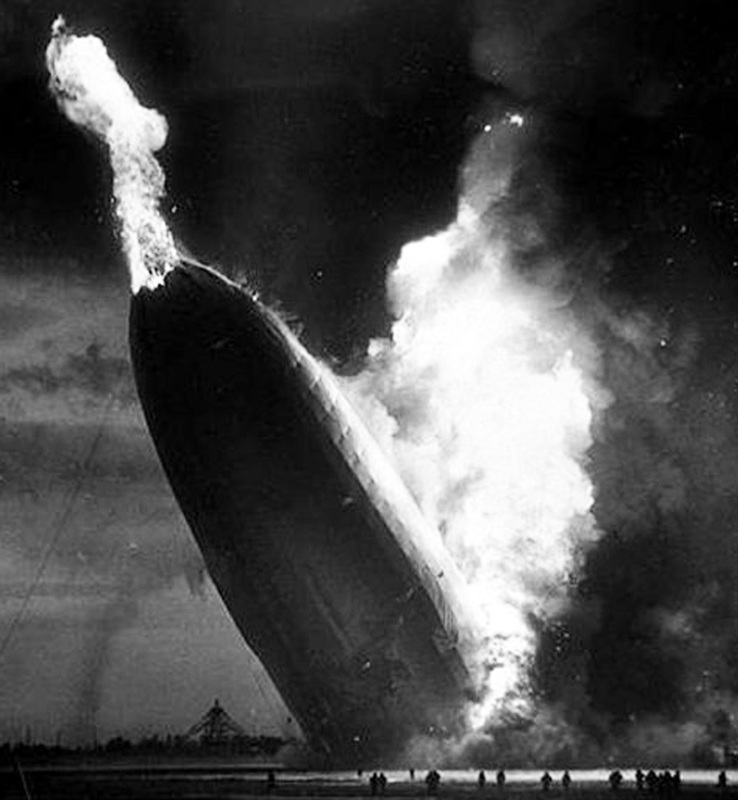 The Hindenburg disaster at Lakehurst, New Jersey on May 6, 1937 brought an end to the age of the rigid airship. The disaster killed 35 persons on the airship, and one member of the ground crew, but miraculously 62 of the 97 passengers and crew survived. After more than 30 years of passenger travel on commercial zeppelins — in which tens of thousands of passengers flew over a million miles, on more than 2,000 flights, without a single injury — the era of the passenger airship came to an end in a few fiery minutes. Hindenburg was the last passenger aircraft of the world’s first airline — her chief steward was the first flight attendant in history — and she was the fastest way to cross the Atlantic in her day. Hindenburg’s passengers could travel from Europe to North and South America in half the time of the fastest ocean liner, and they traveled in luxurious interiors that would never again be matched in the air; they enjoyed meals in an elegant dining room, listened to an aluminum piano in a modern lounge, slept in comfortable cabins, and could even have a cigarette or cigar in the ship’s smoking room. All that came to an end in 32 seconds because above the elegant passenger quarters were 7 million cubic feet of hydrogen gas. Almost 80 years of research and scientific tests support the same conclusion reached by the original German and American accident investigations in 1937: It seems clear that the Hindenburg disaster was caused by an electrostatic discharge (i.e., a spark) that ignited leaking hydrogen. The spark was most likely caused by a difference in electric potential between the airship and the surrounding air: The airship was approximately 60 meters (about 200 feet) above the airfield in an electrically charged atmosphere, but the ship’s metal framework was grounded by its landing line; the difference in electric potential likely caused a spark to jump from the ship’s fabric covering (which had the ability to hold a charge) to the ship’s framework (which was grounded through the landing line). A somewhat less likely but still plausible theory attributes the spark to coronal discharge, more commonly known as St. Elmo’s Fire. The cause of the hydrogen leak is more of a mystery, but we know the ship experienced a significant leakage of hydrogen before the disaster. No evidence of sabotage was ever found, and no convincing theory of sabotaged has ever been advanced. One thing is clear: the disaster had nothing to do with the zeppelin’s fabric covering being “highly flammable” for one simple reason: it wasn’t. 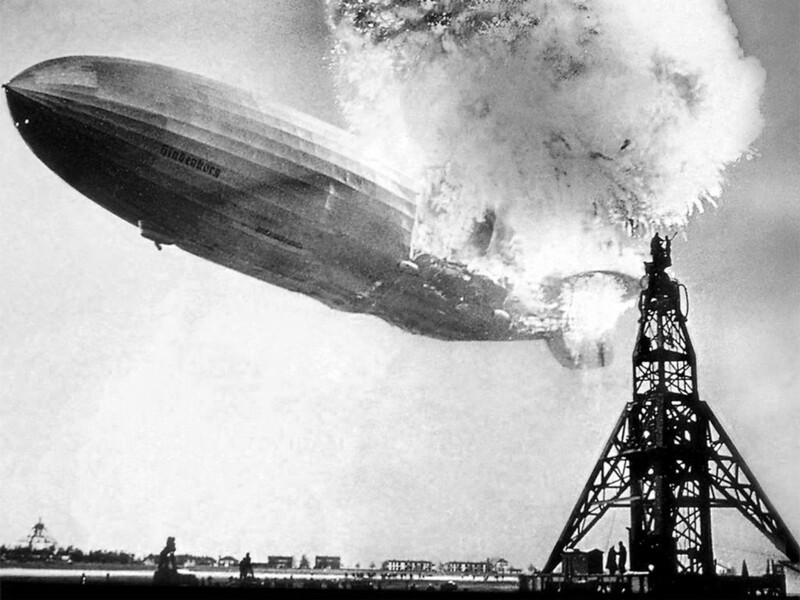 In fact, Hindenburg was just one of many hydrogen airships destroyed by fire because of their flammable lifting gas, and suggestions about the alleged flammability of the ship’s outer covering have been repeatedly debunked. The simple truth is that Hindenburg was destroyed in 32 seconds because it was inflated with hydrogen. Hindenburg began its last flight on May 3, 1937, carrying 36 passengers and 61 officers, crew members, and trainees. It was the airship’s 63rd flight. The ship left the Frankfurt airfield at 7:16 PM and flew over Cologne, and then crossed the Netherlands before following the English Channel past the chalky cliffs of Beachy Head in southern England, and then heading out over the Atlantic shortly after 2:00 AM the next day. Hindenburg followed a northern track across the ocean [view chart], passing the southern tip of Greenland and crossing the North American coast at Newfoundland. 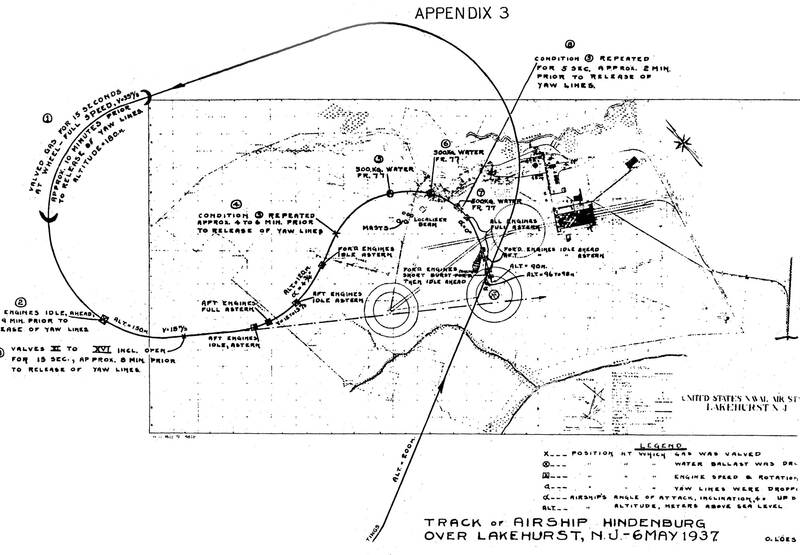 Headwinds delayed the airship’s passage across the Atlantic, and the Lakehurst arrival, which had been scheduled for 6:00 AM on May 6th, was postponed to 6:00 PM. 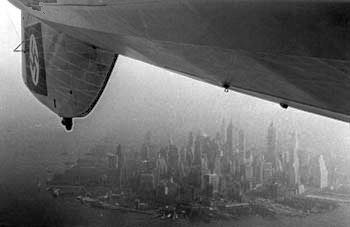 By noon on May 6th the ship had reached Boston, and by 3:00 PM Hindenburg was over the skyscrapers of Manhattan in New York City (view photograph). The gas board used to valve hydrogen to keep the ship in trim. After the S-turn to change the direction of landing, Pruss continued his approach to the mooring mast, adjusting power from the two forward and two rear engines, and at 7:21, with the ship about 180 feet above the ground, the forward landing ropes were dropped. A few minutes after the landing lines were dropped, R.H. Ward, in charge of the port bow landing party, noticed what he described as a wave-like fluttering of the outer cover on the port side, between frames 62 and 77, which contained gas cell number 5 . He testified at the Commerce Department inquiry that it appeared to him as if gas were pushing against the cover, having escaped from a gas cell. Ground crew member R.W. Antrim, who was at the top of the mooring mast, also testified that he saw that the covering behind the rear port engine fluttering. At 7:25 PM, the first visible external flames appeared. Reports vary, but most witnesses saw the first flames either at the top of the hull just forward of the vertical fin (near the ventilation shaft between cells 4 and 5) or between the rear port engine and the port fin (in the area of gas cells 4 and 5, where Ward and Antrim had seen the fluttering). Location of helmsmen Helmut Lau at the time of the explosion. The fire quickly spread and soon engulfed the tail of the ship, but the ship remained level for a few more seconds before the tail began to sink and the nose pointed upward to the sky, with a blowtorch of flame erupting from the bow where twelve crew members were stationed, including the six who were sent forward to keep ship in trim. In the port and starboard promenades on the passenger decks, where many of the passengers and some of the crew had gathered to watch the landing, the rapidly increasing angle of the ship caused passengers and crew to tumble against the walls, the furniture, and each other; passenger Margaret Mather recalled being hurled 15-20 feet against the rear wall of the dining room and being pinned against a bench by several other people. The fire spread so quickly — consuming the ship in less than a minute — that survival was largely a matter of where one happened to be located when the fire broke out. Passengers and crew members began jumping out the promenade windows to escape the burning ship, and most of the passengers and all of the crew who were in the public rooms on A Deck at the time of the fire — close to the promenade windows — did survive. Those who were deeper inside the ship, in the passenger cabins at the center of the decks or the crew spaces along the keel, generally died in the fire. One passenger, John Pannes (the New York manager for the Hamburg-America Line, which handled passenger reservations for the Deutsche Zeppelin-Reederei), was in the dining room when the fire broke out; encouraged to jump by ship’s photographer Karl Otto Clemens, who escaped through one of the windows and survived, Pannes instead left the dining room to find his wife Emma, who had returned to their cabin for her coat. Both died in the fire. Mr and Mrs Hermann Doehner and their three children (Irene, 16; Walter 10; and Werner, 8 ) were also in the dining room watching the landing, but Mr Doehner left before the fire broke out. Mrs Doehner and her two young sons jumped to safety, but Irene left the dining room in search of her father, and both died as a result of the crash. 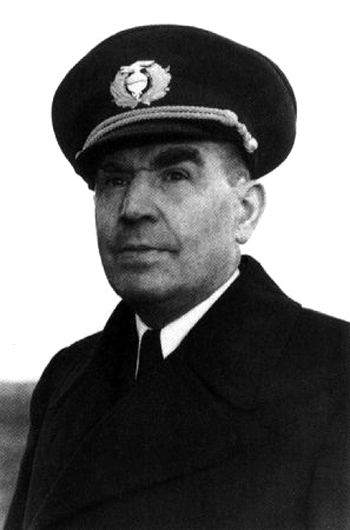 Given the speed with which Hindenburg burned, survival for the crew was also largely a matter of luck. As the diagram below illustrates, those who were close to a means of exit at the time of the fire generally survived, including 9 of the 11 men in the engine cars, and 10 of the 12 men in the control car. Those who were deep inside the ship, such as the electricians in the power room along the keel, or Max Schulze in the smoking room bar on B Deck, or those on the starboard side (since the flaming ship rolled slightly to starboard as it hit the ground) were generally trapped in the wreck. And the men stationed in the bow — who were exposed to the column of flame that rose through the ship as the bow pointed skyward — had the least chance; the 9 men who were closest to the front of the ship at the time of the fire all died. As the ship settled to the ground, less than 30 seconds after the first flames were observed, those who had jumped from the burning craft scrambled for safety, as did members of the ground crew who had been positioned on the field below the ship. The public seemed remarkably forgiving of the accident-prone zeppelin prior to the Hindenburg disaster, and the glamorous and speedy Hindenburg was greeted with public enthusiasm despite a long list of previous airship accidents. But while airships like USS Akron (on which 73 died) crashed at sea, and the British R-101 (on which 48 were killed) crashed in the darkness of night — both far from witnesses or cameras — the crash of the Hindenburg was captured on film. Millions of people around the world saw the dramatic inferno which consumed the ship and its passengers. Oh, the Humanity! At least, that’s the conventional wisdom about why the age of the zeppelin died that rainy day at Lakehurst. But perhaps after 35 years of accidents and disasters — the crashes of LZ-4, LZ-5, Deutschland, Deutschland II, Schwaben, R-38, R-101, Shenandoah, Akron, Macon, and the list goes on — perhaps the public had just had enough. And more importantly, despite its romance and grandeur, Hindenburg was obsolete before it ever flew. On November 22, 1935 — three months before Hindenburg first took to the air — Pan American Airways’ M-130 China Clipper made the first scheduled flight across the Pacific. The M-130 could have crossed the Atlantic with ease; its 2,400-mile route San Francisco to Honolulu was longer than distance required to cross the North Atlantic. In fact, Pan Am’s M-130 was designed for the Atlantic, and it was only political (not technological) considerations that prevented Pan Am from inaugurating transatlantic airline service in 1935; the British refused to grant Pan Am landing rights until Britain had a plane that could make the same flight, but Britain was far behind America in the development of a long-distance airliner. Between the cost of its infrastructure and crew, inherent safety issues, and the development of better technology, the rigid passenger airship was doomed long before Hindenburg landed at Lakehurst that fateful day in May. so can we say that hindenberg disaster was somehow caused due to material faiure? 62 Survivors. What was life like for the survivors? How many lived with burns or major disability? How many lived physically normal lives? To survive such an accident relatively unharmed would be absolutely amazing. I am wondering the percentage of the survivors who did.